It's the first budget after Complete Streets, and there's $0 for bikes. The 2017 Separated Lane Network Plan. To stay on schedule, everything in Purple should be constructed this year, but none of it will be. It’s been just over a month since the passage of Baltimore Complete Streets, the nationally recognized Complete Streets ordinance that legally mandates Baltimore design streets through an equity lens, and prioritize pedestrians and bicyclists to the greatest extent possible. Baltimore City Department of Transportation was required to provide an update to the Baltimore City Council Land Use and Transportation Committee on day 30 after enactment, but no such update came. Instead, we were greeted with the FY2020-2025 Capital Improvement Program, the city’s latest budget documents. Traditionally, Baltimore City DOT includes line item 508-019 Citywide Bike Infrastructure, which details proposed funding for bike improvements over the following six fiscal years, breaking down revenue sources by general/local funds, state grants, and federal highway grants and allocations. 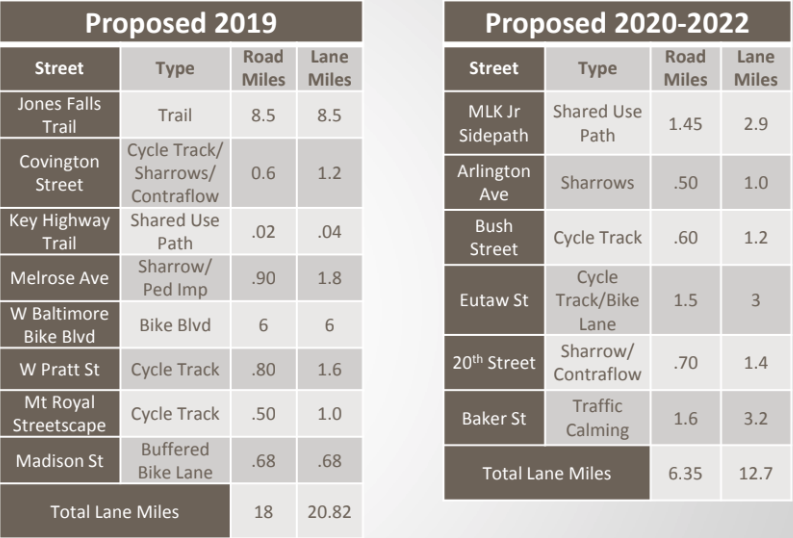 FY2019-2024 CIP showing the line item for Citywide Bike Infrastructure. It was removed in this year’s CIP. 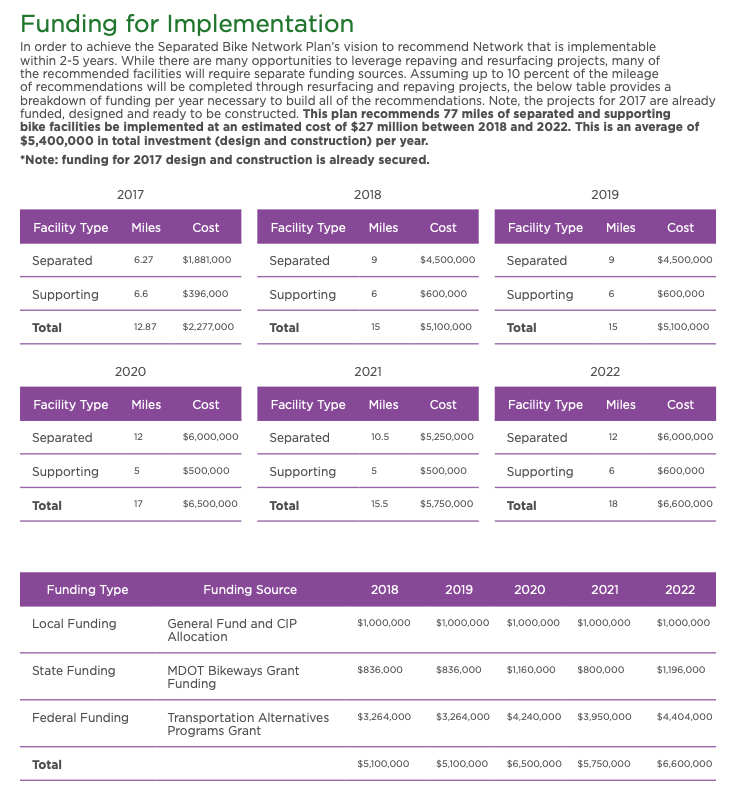 The 2017 Separated Lane Network Plan, adopted by the Baltimore City Planning Commission under Mayor Pugh, specifically calls for $1,000,000 per year of General Funds for five years. By leveraging Maryland Department of Transportation Bikeways and Federal Transportation Alternatives Program grants that require a local match, this approximately $5 million in local dollars could build the entire Separated Lane Network in five years. Building this network would connect 85% of Baltimoreans to low stress bicycle infrastructure. It’s one of the lowest cost, highest return bike plans in the country. 2017 Separated Lane Network construction timeline, budget, and revenue sources. It’s pretty simple. Win big grants with small matches of local dollars. Build 17 miles of high quality separated and supporting infrastructure per year for five years. End with one of the best networks in the country. Every project listed for “Proposed 2019” is a prior year project. Every single one of these projects was already counted in lane mile totals in 2017 when the Separated Lane Network plan was adopted, because all of these projects were supposed to have been constructed by then. Delaying projects by anywhere from 3-7 years doesn’t mean you get to count them again. The “Proposed 2020-2022” projects include MLK Jr, Eutaw Street, 20th Street, and Baker Street. If you refer back to the Separated Lane Network Plan map at the top, you’ll see these projects are supposed to be completed this year, in 2019, not proposed for 2022, the year the entire network plan is supposed to be built. In short, Baltimore City Department of Transportation has budgeted zero dollars of new bike design and construction money for the next six years. The projects they’re double counting as mileage are projects that were already counted in prior years. And the new projects they’re proposing are coming years late, if at all since they haven’t promised funding alongside them. We will be testifying at the Baltimore City Planning Commission on Thursday, January 10th about this disparity between city-adopted plans and the Capital Improvement Budget. Over the next few weeks, we’ll also highlight some planned and ongoing infrastructure projects that are costing or will cost the city millions of dollars while making streets less safe for people walking, biking, and taking public transit. Baltimore City Department of Transportation knew this Complete Streets ordinance was coming. They knew it was going to pass. This budget was an opportunity for them to show that they were making preparations to right their ship, but instead they continue to fire cannons at their own sails. North Avenue Rising: Let's Make it Better! This post has been updated to reflect additional information received by Bikemore after publishing. Earlier this week, Senator Mikulski’s office announced Baltimore’s receipt of a $10,000,000 TIGER Grant for roadway improvements to North Avenue. The project application, entitled “North Avenue Rising,” was submitted by the Baltimore City Department of Transportation and Maryland Department of Transportation including the Maryland Transit Administration. The $10 million in federal funding is being matched by $14.7 million of state funding, $1.6 million in already-committed FHWA funding, and $1 million of Baltimore City funding. The bulk of the $27.3 million project, $8.9 million, will focus on sidewalk and crosswalk improvements. Investments in transit infrastructure including bus stop shelters, transit signal priority at intersections, investments in the Penn/North Metro Station, and dedicated lanes amount to about $7.5 million. Funding for bicycle infrastructure makes up less than $1 million. While early in design, the project as currently scoped has major shortcomings. Dedicated bus lanes stop and start through parts of the project, because Baltimore City Department of Transportation does not want to fully prioritize bus service over private automobiles along the corridor. There are bike share stations planned for key intersections, but there are no dedicated bicycle facilities planned for North Avenue in the project. While the dedicated bus lanes will be signed as shared with bikes, other infrastructure is relegated to stretches of parallel facilities that are sometimes several blocks away. This contradicts the 2015 bicycle master plan, which calls for North Avenue to be a “main route” for bicycles, requiring dedicated, protected bike lanes. It also contradicts a multi-year collaborative community design process undertaken by the Neighborhood Design Center, which culminated in 2015. That plan also calls for protected bicycle facilities along much of West North Avenue. These improvements alongside dedicated transit lanes would further reduce personal vehicle travel lanes or parking, and Baltimore City Department of Transportation was unwilling at the time of project submission to sacrifice convenience of personal automobile users to accomodate safe, protected lanes for people who bike alongside fully-dedicated transit lanes throughout the corridor. Luckily, it is not too late to improve the North Avenue Rising plan. North Avenue has significant right-of-way, and advocacy for expanded funding of this project and true prioritization of transit and bicycles as required by our complete streets policy, and as outlined in our master plans, could allow for fully-dedicated bus lanes along the corridor adjacent to dedicated bicycle facilities. Additional personal vehicle lane reduction or reduction of some parking along North Avenue would allow for design of an Offset Bus Lane Street with dedicated, parking or flex-post protected bicycle lanes. This treatment is endorsed by the National Association of City Transportation Officials (NACTO), of which Baltimore is a founding member. Additional personal vehicle lane reduction or reduction of some parking along with additional funding would allow for a true dedicated Median Rapid Transit Corridor for the widest portions of North Avenue. This treatment would include protected bicycle facilities and a curb-separated right-of-way for transit operations, improving bus speed and reliability while allowing for a future upgrade to rail transit on the North Avenue corridor. Additional funding should should be leveraged by this grant award to make it a truly great project for Baltimore. The TIGER grant money should not be used for routine resurfacing, instead it should be used to bolster this project's innovation in biking, walking, and transit design. Governor Hogan can pay for the overdue resurfacing of a state marked highway, like he is doing in every other county in Maryland. Bikemore wants to see North Avenue rising. >33% of households are zero car in pink areas. >66% of households are zero car in red areas. Neighborhoods along the project corridor have some of the highest rates of households that lack access to a car in Baltimore City. Dedicated transit lanes will make buses faster, more convenient, and more on-time on this critical transportation corridor. Protected bike lanes will allow people to safely use bike share while calming traffic and making the street safer for people who walk. There is no reason to prioritize personal automobile throughput over the safety and convenience of neighbors and people who walk, bike, and take transit on this corridor. Agencies involved in this project are open to our recommendations, and we look forward to working with them to advance a vision for North Avenue that truly promotes biking, walking, and taking transit. But more advocacy around complete streets is clearly needed, because a project that does not completely consider and include all modes should not be constructed, and we should not accept a political climate unwilling to include adequate design for biking in project submission. This is a great opportunity to make one of the only wide roads in Baltimore functional for all users, and a mistake in infrastructure here will have to be endured for years to come. We must get to a place where our city prioritizes people over personal cars by default, not as an afterthought. As this project continues to develop, we will notify you of ways to get involved and ensure we get the best possible design for people who bike, walk, and ride transit. The proposed bicycle master plan update includes many ambitious and excellent proposals for improving safety and comfort for bicyclists in Baltimore, whether they ride for recreation or transportation. The proposed bicycle facility network, once fully constructed, would allow many thousands of Baltimore residents and visitors to be able to use bicycle-specific infrastructure to access their jobs, schools, grocery stores, favorite restaurants, and social activities by bicycle. The health, quality of life, and local economic benefits of a high quality bicycle transportation network are well documented, and the City should be commended for its plans to implement these measures. However, recent events in our City underscore the fact that it is not simply the presence of a bicycle facility, but also the type of bicycle facility that really increase the safety and comfort of bicyclists. The Master Plan Update includes the possibility of standard bicycle lanes on "main routes," which are often identified to be located on arterial roadways, and shared lane markings, or sharrows for "minor routes." There may be some streets where these treatments are appropriate, but facility selection must be strategic and sensitive to the operating conditions of the street, in order to maximize the safety and comfort of all users. Bikemore's proposal is that facilities with some physical separation be the default preferred facility for streets with 85th percentile speeds above 25 miles per hour. This is the suggested threshold because it is an approximation of the speed beyond which crashes between automobiles and bicyclists or pedestrians become dramatically more likely to result in death or grievous injury. We propose using measured 85th percentile speeds as opposed to the speed on the speed limit sign because of the frequency with which drivers exceed the speed limit. Furthermore, sharrows are only an appropriate choice for local streets, and in conjunction with traffic calming and "bicycle boulevard" measures that keep 85th percentile speeds below 25 mph, or, ideally, closer to 20 mph. It may also be appropriate to use sharrows to connect short gaps between higher quality facilities. This position is consistent with NACTO Bikeway Design Guidelines and emerging research about the safety and functionality of different bicycle facility types. These recommendations will result in the selection of safer, more comfortable facilities, while also allowing for creative solutions in locations where space may be too constrained for a separated bicycle facility. For example: if the 85th percentile speed on a street is above 25 mph even though the signed speed is not, and a separated bicycle facility cannot be accommodated, we would find it an acceptable solution to install the standard lane or a paint-buffered lane in conjunction with bicycle friendly traffic calming measures. In severely space constrained locations, standard painted bike lanes may be acceptable in the absence of traffic calming measures for small lengths of narrower cross section on a street, if other factors such as adjacent parking, driveway conflicts, and door zones are taken into account. Where these compromises must be made, we recommend that Bikemore or other credible bicycle advocacy entities be consulted to help collaboratively develop the safest and most comfortable bicycle facility that is feasible in the space available.